ISLAMABAD: Japan has lauded Pakistan’s efforts for regional peace and stability and would continue to provide financial and technical assistance for the economic and social uplift of the people besides supporting its war against terrorism. Briefing the media, the deputy press secretary and spokesman of the visiting Japanese Foreign Minister, Toschi Hide Ando , Thursday said Japan’s Foreign Affairs Minister, Taro Kono during his meeting with his Pakistani counterpart had appreciated Pakistan’s efforts against war on terrorism, which he said was important for the regional peace and stability. Japan would provide support to Pakistan in war on terrorism, he added. Toschi Hide Ando said his foreign minister has discussed bilateral, regional and international issues with his Pakistani counterparts. They also discussed the issue of non-proliferation and comprehensive Nuclear-Test-Ban treaty (CTBT). Japan had longstanding relations with Pakistan since 1952. This was the first visit of Japan’s foreign minister in the past 9 years, he added. Responding to a question, he said Japan appreciates Pakistan’s efforts to eliminate terrorism and would continue to support such efforts. However, he said, Pakistan had some other challenges as well and it had to cope with those as well. About a question on Pak-India relations, he said Japan appreciates Pakistan’s efforts to bring peace and stability in the region. When asked about his stance on human rights violations being committed by occupying Indian forces, he said, he could not say anything except that Japan was concerned about human rights situation in occupied Kashmir. To another question, he said regional stability was very important and hoped that efforts were being made to achieve durable peace in the region. 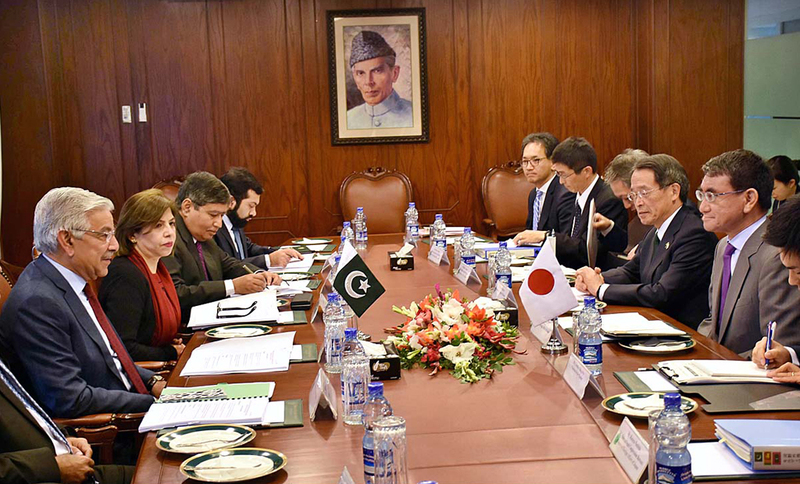 Japan’s foreign minister, he said had expressed his concern on situation in occupied Kashmir and stressed on Pakistan and India to solve their issues through dialogue. Replying to a query, he said the visit of the foreign minister would strengthen relations between the two countries and would play a role in further cementing the ties between the two nations. On a question on China Pakistan Economic Corridor (CPEC), he said the infrastructural project should be open for all and transparent, which he added was pre-requisite for such projects. He avoided commenting on Japan’s plans to invest or participate in the project. On a question about Pak-US relations, he said the both countries should constructively cooperate for the elimination of terrorism. On the issue of Palestine, he said two state solution was the only option to bring peace in that region. The deputy press secretary and spokesman of the visiting Japanese Foreign Minister, Toschi Hide Ando, also informed the media that his foreign minister, Taro Kono also held a meeting with the Chief of Army Staff, General Qamar Javaid Bajwa and talked about regional issues especially Afghanistan and North Korea besides security issues in general. The meeting lasted for 70 minutes, he informed. He said Japanese foreign minister appreciated Pakistan’s efforts against terrorism. Japan strongly condemned all forms of terrorism, he added.